The Traverse lavatory and wall-mount vanity blend sleek, modern design and functional storage with construction methods that minimize environmental impact. The Traverse is designed to be used with its coordinating KOHLER ITB lavatory, an integrated top and bowl. Constructed from vitreous china, the Traverse lavatory offers a clean aesthetic with ample workspace on either side of the basin. The lavatory’s sloping wet work surfaces and large basin allow you to perform grooming tasks with ease. A modern interpretation of the flat top trunk of the early 1900s, the vanity’s flat, clean lines provide distinction from the basin and side workspaces. 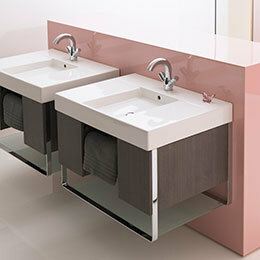 The vanity also is ideal for combination with a granite or concrete top, or other customized pieces. And it has exceptional storage capacity, with drawer inserts for efficient organization of your toiletries. A lavatory is always important in a toilet be it be toilet in the house or porta potty.